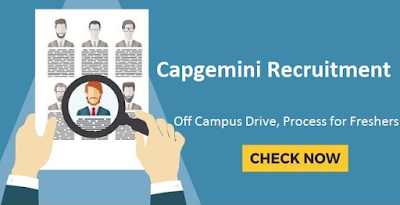 Capgemini Recruitment Process For Freshers: Capgemini is a CMM Level 5 multinational company having branches/ offices across India. It has branches in more than 40 countries with over 2 Lakhs of employees. Capgemini is expanding its business potential through a series of acquisitions. Capgemini has more than 40 branches in 10 locations across India. The need for new resources increasing every quarter in India. Capgemini employment opportunities for fresher and experienced candidates on various software technologies and domains available throughout the year. Especially for the recruitment of freshers, the company conducts campus recruitment drives and off campus drives in colleges every year. Candidates attending the Capgemini campus drive should have a minimum of 60% (or) above in their academics. Capgemini recruitment test contains a written test followed by Group discussion and interview. The written test includes basic mathematical questions along with logical reasoning and English. The group discussion or Just a Minute (JAM) is for checking the candidate's communication skills. Please go through the following link for successful registration in Capgemini careers web portal. After clicking on the link, you are directed to a page with the latest drives across various Capgemini locations in India. Select the location for which you want to apply.